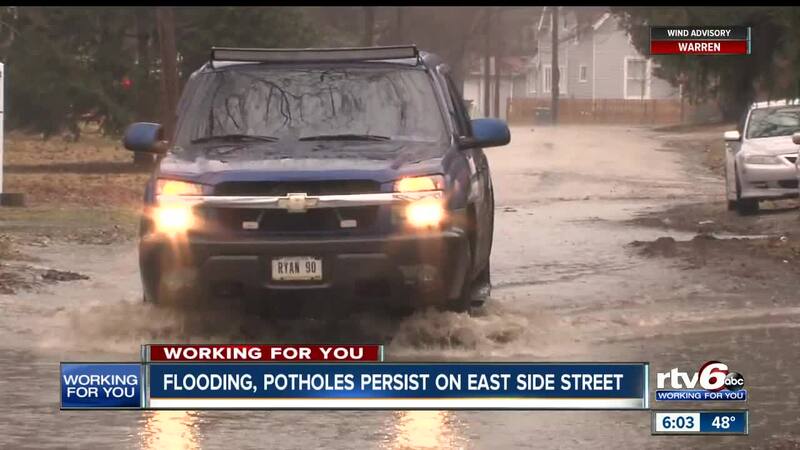 INDIANAPOLIS — Flooding and potholes are a big problem for people who live on Rawles Avenue in Irvington. An east side resident, Jacoby Hardy, tries to get a sense of how deep water is in a pothole by using a stick as a makeshift ruler. No matter how deep the water is - his frustration is deeper. RTV6 first met him in June and he was complaining about potholes and standing water. Today, he is complaining about potholes and standing water. "Especially during the winter when it all freezes. It's become a giant safety hazard," Hardy said. "It's not safe to drive on the street when it it's all ice." The problem is so bad that neighbors have started calling their street 'Lake Rawles.' It is not a name they use with affection. "It gets really interesting when everything freezes over and becomes a large block of ice. It floods every time it rains even the slightest bit," another east side resident, Terry Halloran, said. "The response I've gotten from the city is it might take years to fix something that is this bad," Hardy said. "They put it on the side and focus on other sides of town that are more up and coming." Department of Public Works indicates a team of engineers working with their maintenance contractor has ruled out ditching, and other maintenance options, as not feasible. "It is unlikely that DPW will be able to address this issue, until we have secured funding for the design, and construction of a capital improvement project, this can take years to occur."